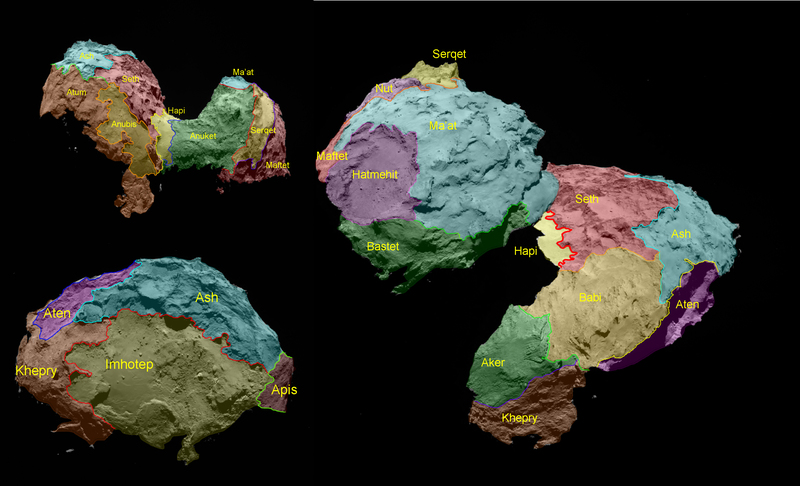 The 19 regions identified on Comet 67P/Churyumov-Gerasimenko are separated by distinct geomorphological boundaries. Following the ancient Egyptian theme of the Rosetta mission, they are named for Egyptian deities. They are grouped according to the type of terrain dominant within each region. Five basic categories of terrain type have been determined: dust-covered (Ma'at, Ash and Babi); brittle materials with pits and circular structures (Seth); large-scale depressions (Hatmehit, Nut and Aten); smooth terrains (Hapi, Imhotep and Anubis), and exposed, more consolidated ('rock-like') surfaces (Maftet, Bastet, Serqet, Hathor, Anuket, Khepry, Aker, Atum and Apis). More details can be found in The morphological diversity of comet 67P/Churyumov-Gerasimenko, by N. Thomas and colleagues, published in Science on 23 January 2015.